Welcome to Alpha Phi Sigma's big service project for 2018. They are requesting 250 volunteers, total, to help pack the meals. On March 20th volunteers will be split into two shifts; one in the morning, from 8:30 to 12:00 and one in the afternoon, from 12:30 to 4:00. The packing will be held inside of the Marshall County Correctional Facility. Volunteers will need to be on time in order to get through security. Volunteers should also be comfortable working with the inmates and willing to submit a background check. The inmates working with our program are part of the Restorative Justice Program at MCCF, which means they are in good standing. The environment will be safe and the inmates allowed to participate are really excited to have the opportunity to repair some of the harms that they have caused in the their community. In addition to volunteers, they are also looking for donations. Each inmate is going to pack enough meals to feed a child for a year. The monetary cost of those meals are $80. So we are asking people to adopt an inmate by donating $80. Donations are not required and donations of any amount will be accepted. Visit this website to donate to our specific project: https://give.fmsc.org/marshall. Background check will be processed the day of the event. Volunteers will hand-pack rice, soy, dried vegetables and a nutritionally complete blend of vitamins and minerals into bags which are then sealed, boxed, placed on pallets and shipped to our incredible partners working hard to reach the neediest children around the world. 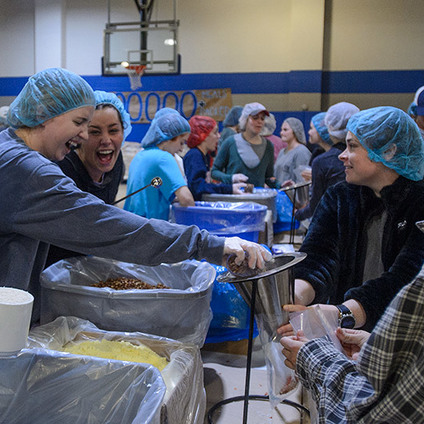 Log in to see who is volunteering for Feed My Starving Children ! Wow, thanks everyone! Signups for this opportunity are full.